← How to convert documents of Microsoft Office Word to dpx? How to convert documents of Microsoft Office Word to dib? Please don’t consider converting document of Microsoft Office word to dib as a difficult task. You can fulfill it well with docPrint which is one available application in docPrint Document Converter Professional. docPrint Document Converter Professional is a software product that dynamically converts MS Office 97/2000/XP/2003/2007, WordPerfect, AutoCAD DWG, PostScript, Adobe Acrobat PDF and many other document types to Adobe Acrobat PDF, PostScript, EPS, XPS, PCL, JPEG, TIFF, PNG, PCX, EMF, WMF, GIF, TGA, PIC, PCD and BMP etc formats. It works in both GUI version and Command Line version. docPrint we mentioned above is another application of docPrint Document Converter Professional. With docPrint Document Converter Professional you can convert your documents from and to 50+ formats easily. In fact, docPrint is a windows printer driver that saves ink, paper and time by controlling printed output, it supports print 2, 4, 6, 8 or 16 pages on a single sheet of paper, it also supports scale A0, A1, A2, A3 papers to standard Letter or A4 paper sizes. When you want to convert word to dib format file, you just need to print the word document to docPrint, then you are able to use the powerful printer. If you want to use docPrint, you should download docPrint Document Converter Professional which is also called docPrint Pro at http://www.verypdf.com/artprint/docprint_pro_setup.exe and install it in your computer. 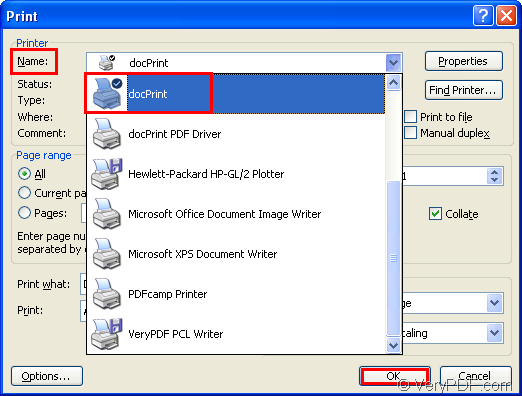 Or you can download docPrint standard version which only contains the printer without GUI application and command line application at http://www.verypdf.com/artprint/docprint_setup.exe. Of course, the standard version is cheaper than Pro version at price, but less powerful. The following contents are the details to describe the process of converting word to dib. 1. Find your word document which needs to be converted and open it. Then you should click “File”—“Print” to open “Print” dialog box and choose “docPrint” as current printer in “Name” combo box and click “OK” button. Please see Figure1. You can also use the hot key “Ctrl”+ “S” on your keyboard to open this dialog box. It will be easier if docPrint is your default printer. You can right click your word document and click “Print” option to run docPrint directly and don’t need to open “Print” dialog box. 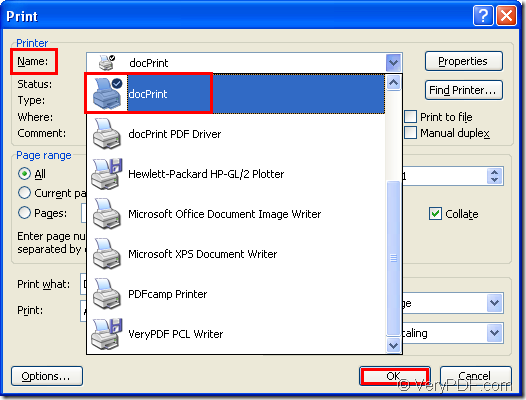 Then you will see “docPrint” dialog box showed in Figure2 in which you can open “Save As” dialog box. 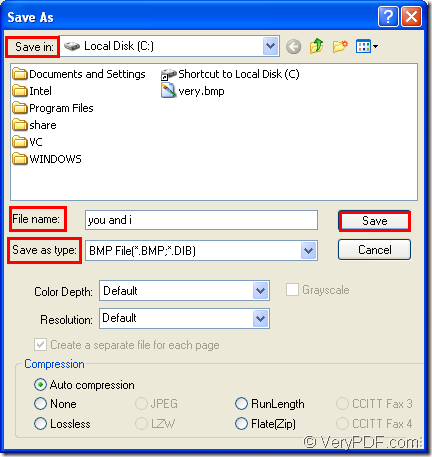 The following methods can be copied to open “Save As” dialog box. You can click “File”—“Save as” to open the dialog box. Or you can use the icon which looks like a floppy disk in the toolbar. The hot key “Ctrl”+ “S” is also a good idea. In “Save As” dialog box showed in Figure3, you should do the following operations to save your target file, which is the last step in the conversion of word to dib. Please find a suitable location for the output file in “Save in” combo box, then input the name for the output file in “File name” edit box. You may not know what is dib format file, actually, dib is another suffix of bmp format file. 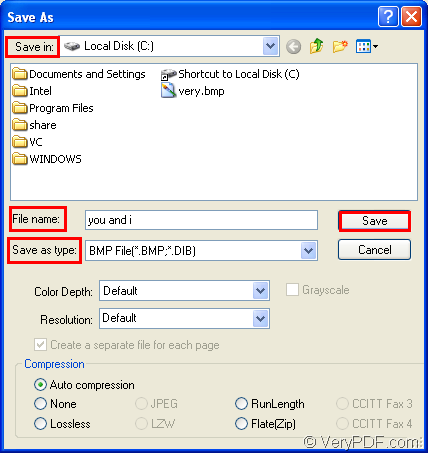 So in “Save as type” combo box, you should choose the output format as “BMP File(*.BMP,*.DIB)”. Then click “Save” button. The conversion will run itself after that. You should wait for a short while until you get the target file in specified location. To learn more information about docPrint, you can visit http://www.verypdf.com/artprint/index.html.